Did you know that you can import data into MYOB from other applications? For example, maybe you have a list of customer names and addresses somewhere else on your computer (maybe in a Word file, a database file or in Excel) and you want to import this information into MYOB. Here’s how to import customer or supplier details in the blink of an eye. The first stage when importing data is to manipulate your customer or supplier listing into a format that MYOB can understand. If your customer or supplier details are currently in a word processor or database, try to get these details into a spreadsheet before you try to import the information into MYOB. For example, if your data is stored in a database such as Microsoft Access, you can usually save this data in a format that can be opened in Excel. Using spreadsheet software such as Excel, arrange the information neatly in columns. Tidy your data so that all names are listed one after the other, all addresses are listed one after the other and so on. With addresses, separate the street, city, state and postcode into four separate columns. Insert a row at the very top of your list (if you haven’t done so already) that labels the columns. For example, Name, Phone 1, Phone 2, Contact and so on. This row is called your Header row. Save this spreadsheet as a tab-delimited file. For example in Excel, go to the File menu, click Save As, and then select Tab-Delimited as the File Type. The Tab-Delimited file format makes it easy for MYOB software to read. From the File menu in MYOB, select Import/Export Assistant. Select Import Data and click Next. 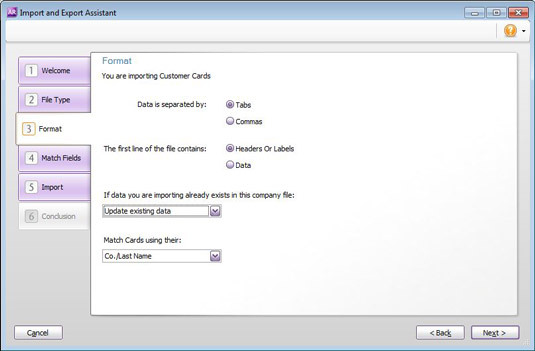 Select Cards as the data type, and either Customer Cards or Supplier Cards as the Cards type. Click Browse, navigate to the folder where you saved your data, and select the file you want to import. Click Next. Fiddle with the settings and click Next. Click Auto Match to get MYOB to automatically match fields and then click Next. Alternatively, you can match fields manually by first highlighting the import field on the left, and then clicking the matching import field on the right. Do this one by one until every field on the left is matched with a field on the right. When prompted, make a backup of your file. Why bother backing up? If you really mess up your import (which sometimes happens the first time around), you can restore your backup and start again. Click Import, and marvel as the fun begins. Sometimes importing takes a painfully long time, sometimes only a few seconds. However, the import is complete when a delightful message pops up to inform you of your success (or failure). If your import failed, read the message carefully! Importing card details into your MYOB company file should be easy, but plenty of gremlins can throw an error message your way. If you get a message after you import data saying the import had errors or warnings, follow the prompt to view the error log. If the import skipped a record, it means that something was so bad that MYOB ignored this customer or supplier completely. If you get a warning message, this means a minor problem occurred and MYOB has rejected a part of a customer or supplier’s details (for example, maybe MYOB has added the customer name, but not the address or phone number). The error log shows a list of every record that has a problem, with an error code showing at the beginning of each one. At first, these error codes look like unintelligible jargon (Error -7, for example, doesn’t mean much to the uninitiated). However, the top of this report provides a list of what each error message means. After you identify which records didn’t import properly and why, you can make one of two moves. If only a few cards are affected, open your company file and fix up these cards one by one. On the other hand, if most of the import didn’t work, your best bet is to restore your backup, fix up the import file and try again.